A chance encounter at a professional training session brought Markraft Cabinets designer Rachel Jindra from the Minnesota countryside to the sandy beaches of the east coast. But looking back, it seems the 26-year-old is right where she is supposed to be. With a longtime passion for interior design – and an eagerness to help others – Rachel has found a new home in Wilmington and a de facto family in her colleagues at Markraft. Interior design is not necessarily what you’d expect from someone who spent her formative years in the outdoors, tending to animals and crops on a third-generation family farm. But the signs were there early on. “I never really thought about it, but when I looked back, I realized I was always drawing and sketching as a kid. And homes were always part of my drawings. Every drawing had a home in it or a room of a home,” Rachel recalled. By college, she knew she “really likes being able to make things beautiful,” and so pursued that path, earning an interior design degree from the University of Minnesota. An internship at a kitchen and bathroom store in Minneapolis soon turned into a full-time job, and the young designer found herself quickly immersed - and thriving - in her chosen field. “I knew I wanted to focus on residential or hospitality sectors. Commercial just did not seem personal enough to me,” Rachel noted. That focus on making connections resonated with representatives at Markraft, who met Rachel at a trade event in Kinston, N.C. An impressive portfolio and instinctive flair for design didn’t hurt, either. Markraft was so impressed with Rachel, in fact, that she found herself traveling to Wilmington via Kinston for a job interview before she headed back home to Minnesota. The bright rays the beach town brings has given Rachel the opportunity to play more with color – be it the warm ocean tones found in waterfront cottages or a bold orange for an ultramodern look. 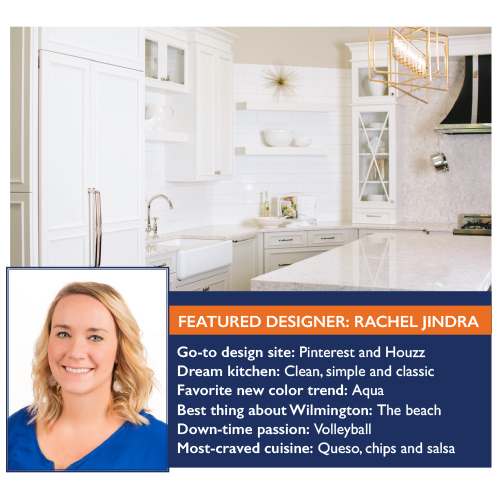 Personally, Rachel prefers the “blank slate” appeal of simple and classic kitchen or bathroom design, something timeless than can be given pops of personality through unique décor and displays. But when it comes to helping her clients, Rachel is eager to find the look that suits them best. And for that, she first uses her ears before putting her eye for design into play. She spends a lot of time on the front end, looking through examples of what her customers like – and often what they don’t like – and uses Markraft’s 3-D design software to show them how their vision will come together. Let Rachel Jindra and the other professional designers at Markraft share their expertise with you. The designers consult by appointment but drop-in visitors are always welcome to stop by and browse the showroom. The Markraft Design Center is open from 9 a.m. to 5 p.m., Monday through Friday, at 2705 Castle Creek Lane just off Castle Hayne Road.